Sharing Mask, a “souvenir from the future” designed by students Homa Abdoli, Mustafa Parsa and Amir Mohammad Sojudi studying at Isfahan Art University in Iran. For the past two years Associate Professor of Industrial Design Paolo Cardini has been traveling far and wide, leading workshops throughout the Global South as part of his recently created workshop series known as Global Futures Lab. This initiative has been the focus of his tenure as the second RISD Global Faculty Fellow, a platform supported by RISD Global and the Provost's Office (Assistant Professor of Literary Arts and Studies Avishek Ganguly earned the first fellowship, while Assistant Professor of Architecture Emanuel Admassu was granted the third). These collaborative efforts between students, faculty and artisans in Iran, India, Cuba, Peru and Ethiopia have now yielded a nuanced and thought-provoking collection of work Cardini calls “souvenirs from the futures”—objects that suggest a vision of a world to come not often represented by the predominantly Western frame of speculative design. On March 1 and 2 in Rome, Italy, these objects, their origin stories and the knowledge gained in the process of making them were the focus of RISD’s Global Futures exhibition and symposium. Students enrolled in RISD's European Honors Program in Rome visit the Global Futures exhibition. Presented in partnership with PostmastersROMA and 1/9 unosunove gallery, the exhibition offered Cardini a clear opportunity: to develop an exhibition design that serves as a template for partnering institutions interested in replicating it in the coming months. 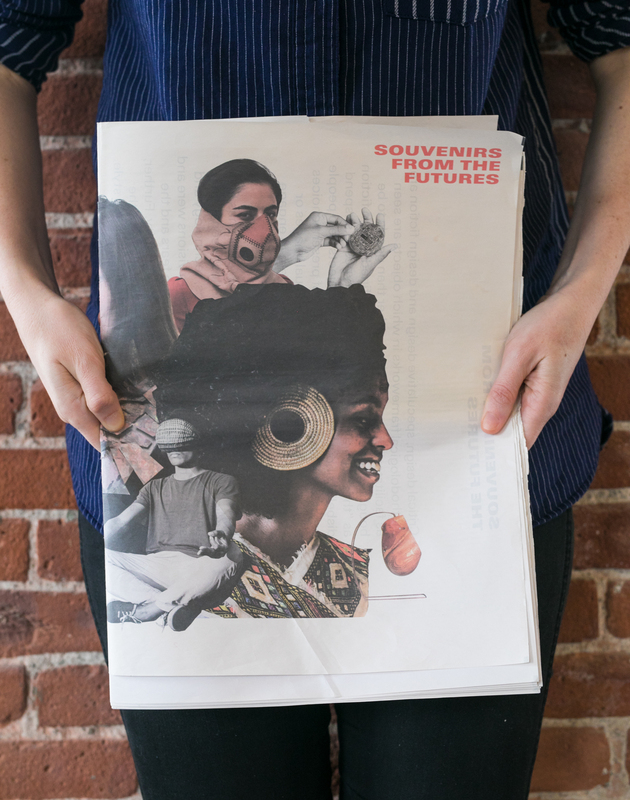 To achieve this, he worked with graduate student Elaine Lopez MFA 19 GD and Center for Arts & Language Director Jennifer Liese during Wintersession to create a newspaper titled Souvenirs from the Futures. The publication serves a dual purpose: it offers a collection of essays and imagery documenting the various Global Futures workshops Cardini has offered at campuses in these countries, while also acting as a series of posters and labels for the works on display, identifying them by title, materials and maker. Cardini skypes with a colleague from Isfahan Art University in Iran during the symposium. Watching the exhibition come to life at the gallery was a satisfying experience for Cardini, who had not yet seen all the “souvenirs” collected in the same physical space. Even more satisfying was facilitating connections between collaborators during the symposium that followed at the Museo Nazionale delle Arti del XXI Secolo (aka MAXXI). In addition to delegations from India, Peru and Ethiopia (poignantly, the Iranian and Cuban participants were unable to attend due to international travel restrictions), the symposium featured speakers known for their work in global design futures, namely: Sohail Inayatullah, a former UNESCO chair in Futures Studies, Tegan Bristow of the University of Witwatersrand in South Africa and Stephanie and Bruce Tharp of the University of Michigan’s Stamps School of Art & Design. The Souvenirs from the Futures publication developed to accompany the exhibition. Similarly inspired by the experience, junior Sophie Chien BArch 20 looks forward to seeing this new knowledge infuse studios and classrooms once she returns from her EHP experience in Italy. “I’m eager to see RISD engaging with design inclusion on an international scale and look forward to its employment back in Providence,” says Chien. International student groups at work during the storytelling phase of their Global Futures workshops. As a Global Faculty Fellow this year and next, Associate Professor Paolo Cardini is promoting pluralistic dialogue about the future through an ongoing series of international workshops. RISD's semester-long program in Seoul invites students to connect with Korean alumni and explore a country of great geopolitical and cultural significance.